100 Programs and 100 Combinations from the best-selling Korg M1 Music Workstation, which can be loaded any into any Krome Workstation. After unzipping the download, please open the "How to load Best of M1" for full step-by-step instructions. This downloadable collection provides 128 “Best of Triton” Programs to be loaded into your Krome. After unzipping the download, please open the “Loading TRITON Programs.pdf” for full step-by-step instructions. Get the complete package of Vintage Synths, Electric Guitars, Soundtrack Mix, Studio Session Mix and Killer Keyboards for the special low price of $125. USD – A $60 savings. 64 Programs, 16 Combis, and 32 MB of sample data covering a wide range of vintage synthesizers. Click here for more details, and click here for loading instructions. 16 Programs, 8 Combis, and 32Mb of sample data featuring a wide assortment of electric guitars. Click here for more details, and click here for loading instructions. A collection of 64 Programs that are perfect for your next TV, video game or film project. Click here for more info. 64 Programs, 16 Combis and 16 MEGS of new multi samples. Click here for more details, and click here for loading instructions. Krome Killer Keyboards contains 64 New Programs. 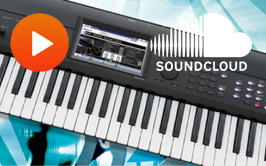 A great mix of new keyboard sounds perfect for your live gig or studio session. Click here for more details, and click here for loading instructions. This download contains 128 Programs and 138 multisamples of new synthesizer sounds for Krome. Please click here for a list of included sounds, additional descriptions, and download instructions. 64 Programs and 4 stereo multisamples containing horns for every kind of contemporary music. click here for the full documentation, including a full list of sounds and installation instructions. 49 Programs and 39 multisamples remeniscent of a famous sampling keyboard from 1984, including orchestra hits, special effects, Indian string instruments, Australian didgeridoos, and strings including the famous "Marcato Strings." click here for the full documentation, including a full list of sounds and installation instructions. 32 Programs and 10 multisamples of unforgettable sound effects from the famous classic sci-fi TV shows and movies of the 1960s. click here for the full documentation, including a full list of sounds and installation instructions. This web page provides instructions and details for downloading and purchasing KRONOS Sound Libraries. To make a purchase, simply follow the steps listed below. Click “Add to Cart!” next to the desired EXs or KRS library. When you do so, notice that the text changes to “Proceed to Checkout.” You can add multiple items to the Shopping cart. The number of items in the Shopping Cart is shown inside the Shopping Cart icon at the top right of this section. When you have added the desired items to your Shopping cart, click “Proceed to Checkout,” or just click on the Shopping Cart icon. If you have completed the KRONOS User Registration and Log-in, the Checkout page will appear. If you have not completed the KRONOS User Registration and Log-in, the REGISTER page will appear. Please follow the instructions on this page. After completing log-in, the Checkout page will appear. If you’ve purchased KRS libraries, the KRS data will be made available for download. If you’ve purchased EXs libraries, the authorization code(s) will be displayed. If you have not already done so, download and install the EXs data. Then, use the code(s) to authorize the new EXs on the Global Options Info page.